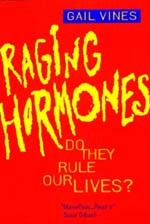 Raging Hormones Do They Rule Our Lives? Are menopausal women happier if they have hormone replacement therapy? Does testosterone make men more aggressive than women? Are hormones responsible for homosexuality? Is fatness caused by hormones? Hormones—the very word conjures images of distraught women suffering from premenstrual tension or menopausal instability. Can a man blame his behavior on the fact that he's a man—"the testosterone made me do it?" The belief that our hormones control how we behave runs deep in both scientific and popular culture. Now Gail Vines examines this enduring belief, and her timely study illuminates the differences in the perceived role of hormones in women and men's lives. Sexual deviance, stress, athletic prowess, criminal behavior, eating disorders—these and other conditions are commonly linked to the effects of hormones. Circadian rhythms, light, sleep, as well as social environment, can influence the intricate chemical flow within our bodies. Vines looks at the many ways that hormones are now being used to gain control over our lives. She discusses hormone replacement therapy for menopausal women and the current notions that homosexuals are born with a "hormonally imprinted gay brain." Being at the mercy of certain hormones, and thus potentially out of control, is part of the popular image of "being a woman." The issue of control and the anxieties surrounding difference and equality form the leitmotif of Raging Hormones. In questioning the easy promise of a "hormonal fix," Gail Vines alerts us to one of the most challenging arenas of contemporary social and scientific debate. Gail Vines is a science journalist living in Cambridge, England. She is coauthor of both The Evolution of Life (1986) and Tomorrow's Child: Reproductive Technologies in the '90s (1992) and has twice won the Glaxo/Association of British Science Writers Award.